from stores like Adidas, Benetton, Converse, Killer, Lee, Lawman, Puma, Peter England, Reebok and Wrangler. Check out New Arrivals - Men Clothing Online. Get Upto 50% off On Clothing. 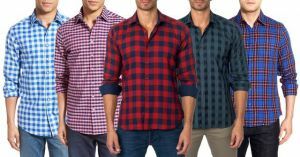 Choose from a wide range mens t shirts, casual and formal shirts for men, jackets for men, blazers for men. We also have large collections of ethnic wear for your wedding like sherwani, mens kurtas, casual shirts and blazers. Rediff Shopping is one of the largest online shopping destinations in India. We provide comfortable and secure shopping experience with option of paying through Cash on Delivery (COD), Debit Card, Credit Card and Net Banking.